Drain chickpeas and rinse them well with cold water. 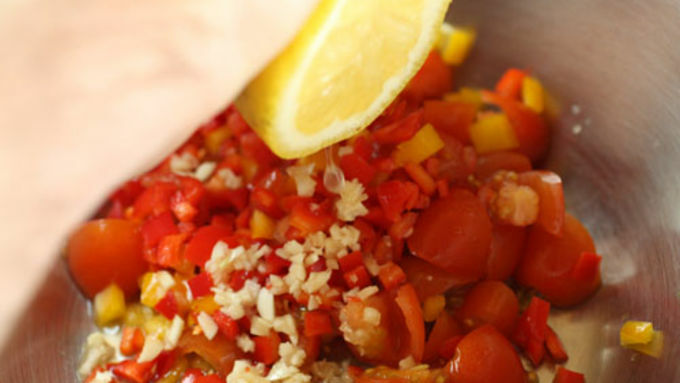 Chop tomatoes, peppers (you can use any kind really), and mince garlic. Add to a bowl with juice from 1/2 lemon. 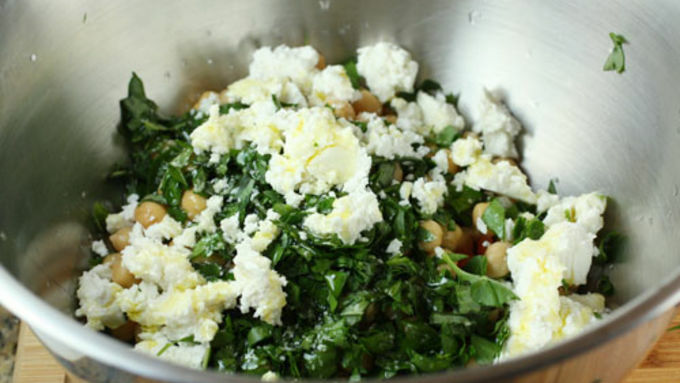 Mince fresh herbs and add to bowl along with crumbled feta and chickpeas. Serve at room temperature or chill and serve. Keeps for days and gets better in the fridge! I like to cook obviously so I don't mind spending my spare time in the kitchen. But, sometimes we all need quick and easy recipes for when we're short on time. Luckily, I have a library of dishes that are actually incredibly quick to make. They are my all-purpose dishes. They can work as a lunch or a side dish with dinner. They are very versatile and most of them take just a few minutes to toss together. 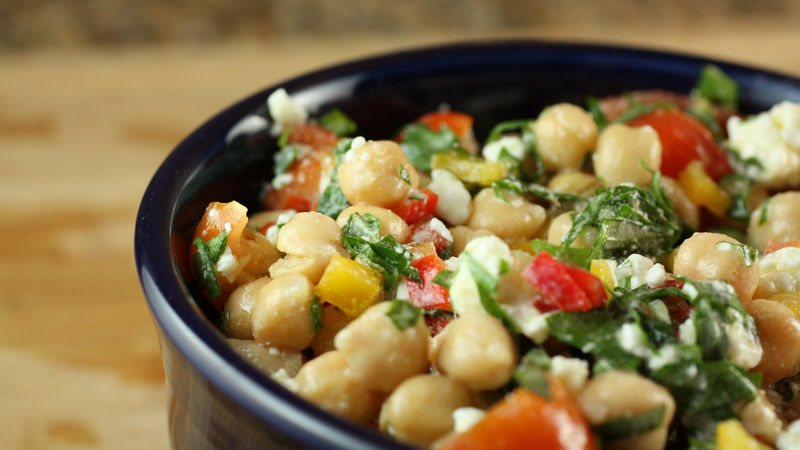 This chickpea salad is just one example, but may be my favorite at the moment. This salad is perfect for the spring/summer months because it depends entirely on getting some really fresh veggies. I used a few small sweet peppers for my version, but you could use a red pepper, a banana pepper, or even something spicier like a poblano. This salad takes literally 10 minutes to make. I served mine with some grilled chicken. I rubbed the chicken with my all-purpose rub and it paired great with the salad. This is a perfect example of when good, healthy cooking doesn't have to take all day. You can almost mix this salad together during a commercial break! 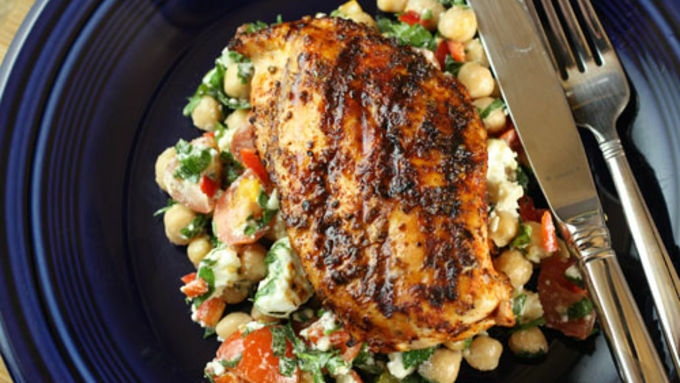 More Chickpea Recipes Like chickpeas? Here are a few more ideas!